It’s hard having to come to terms with the responsibility of being the Dragonborn. The warrior with the body of a mortal and soul of a dragon whose destiny it is to vanquish the tyrannical dragon Alduin in order to save the world from destruction, it’s, understandably, a lot to take in. That’s why I spent several hours dallying with side quests while saving gold to buy a house in Whiterun rather than rushing to answer the Greybeards’ presumptive summon. Even having played it on Xbox 360 and Xbox One S, I couldn’t contain my excitement when, after it made a surprise appearance in the First Look at Nintendo Switch reveal trailer, Bethesda Softworks would later confirm that The Elder Scrolls V: Skyrim was adventuring to the plucky portable home console. Whether at home or on the move, we now have that chance to trek around Skyrim anywhere at anytime. It may have been six years since it first released, but The Elder Scrolls V: Skyrim has continued to thrive on the stories that its players have to tell rather than the many accolades that were, quite rightly, thrown at it. I can talk about the time that a fugitive shoved a Hide Helmet of Archery in my hands and warned that he would murder me if I snitched or double-crossed him, or when I ran to Riften only to witness a dragon attack the city as I wandered through its gates. Then, there was the time I accidentally killed my stoic and unemotional companion Lydia with a mistimed sword swing and feeling intensely guilty reloaded my save, when I went to hug an adorable-looking Horker only to find out that they were hostile as it tried to chomp me, the random skeleton I found in Dragonreach’s moat, or even when I dropped my Gloves of the Pugilist, as my character was over-encumbered, only for Arniel Gane to randomly appear and ask whether it was ok that he took them. Standing atop one of Skyrim’s many snow-capped peaks, it’s hard not to be impressed at the sheer scale to the game’s world. But it is in these random moments that The Elder Scrolls V: Skyrim impresses me most, not only helping players to allow themselves to become lost in the game’s beguiling spectacle but soon prompting them to share their experiences and discoveries with friends. In many ways, that’s similar to what Nintendo has achieved with The Legend of Zelda: Breath of the Wild. It’s that unrivalled freedom to be whoever you like and to do whatever you want that makes this open-world fantasy epic such a thrill to exist in. Even the race that you choose to play as not only determines the initial proficiencies that your character has but how everyone reacts to you in the world. The Dragonborn you may be, but the disdain between certain races is hard to shake. And, while your chosen race may steer you toward certain gameplay styles, with enough patience you can build your hero to be proficient in any area imaginable – whether that be one-handed weapons, archery, one of the many schools of magic, or others. Or, you can just spend your time shouting at people. The northern part of Tamriel is a treacherous place, not least for the fact that you will encounter rabid wolves on a near constant basis. Whether you want to swing a steel warhammer at someone’s jaw, cast fire in someone’s direction from your palms, or fling arrows for bonus sneak attack damage from the shadows, combat readily thrills – especially when you are fighting to turn a battle back in your favour, or working alongside NPCs to take down a dragon as it breathes fiery flames from the skies. For those that want to become more involved with the experience, Bethesda Game Studios has also implemented optional motion controls. These are exclusive to the Nintendo Switch version, and, playing as a Bosmer (Wood Elf) archer, I can’t really put into words how incredible it was to have such nuanced aim with the bow. There’s still button input required for actions like drawing an arrow, but even wielding a sword and shield can see you raise the left Joy-Con to block and incoming attack to then swing the right Joy-Con to retaliate. It’s gesture input rather than completely mirroring your actions, of course, but many will certainly enjoy experiencing The Elder Scrolls V: Skyrim in a new way, even if it’s probably not suited to lengthier sessions as your arms will tire. And, away from combat, you can also use motion control to pick locks, holding the ZL button as you turn the left Joy-Con to rotate the pick and holding the ZR button and twisting the right Joy-Con to turn the lock. This actually made such thievery far easier, as, with HD Rumble, you can feel the pick clicking past the lock’s mechanism, with the strongest vibration indicating that you have struck the sweet spot. There is intricate detail to Skyrim’s world, whether that be found in the pages of the books that are littered around or the conversations that you have with those that inhabit it. And, there is much to do, too. With caverns to explore, side quests to complete, and a property empire to build for those that want a house in every major town, you can also spend your time cooking, messing around with alchemy, enchanting weapons, or improving armour on workbenches. If you want to, of course. Early on, as a civil war ravages the province you will also choose between siding with the Imperial Legion or Stormcloaks, that will send you on a path down another questline. There’s also the chance to carry out assassination contracts after joining the Dark Brotherhood, enrolling at the College of Winterhold to study Magicka, fighting alongside the leaderless warriors in the Companions, or becoming a professional thief with the Thieves Guild. You’re free to do whatever you choose, but, already, that’s an impressive amount of content to sink time into. But, if that wasn’t enough, then The Elder Scrolls V: Skyrim for Nintendo Switch comes with the three official add-ons: Dawnguard, Hearthfire, and Dragonborn. These can see you hunt down the Vampire Lord Harkon or become one yourself, purchase land to build your own home, and journey to the island of Solstheim where you can learn new shouts, tame dragons, and take on The First Dragonborn – adding more hours on to an already exhaustive game. You will be happy to hear that The Elder Scrolls V: Skyrim has received a competent and robust port to Nintendo Switch, too. The user-created mods may be absent, but this is a technically sound version with favourable load times to other platforms – 20 seconds to load your save from the main menu, 10 seconds when fast travelling, and a few seconds when transitioning between areas – and a steady framerate. It’s not blemish-free, however. I did encounter some framerate slowdown once or twice and there was an odd recurring audio crackle on occasion, but, in the grand scheme of things, this only affected a very small amount of my time with the game. 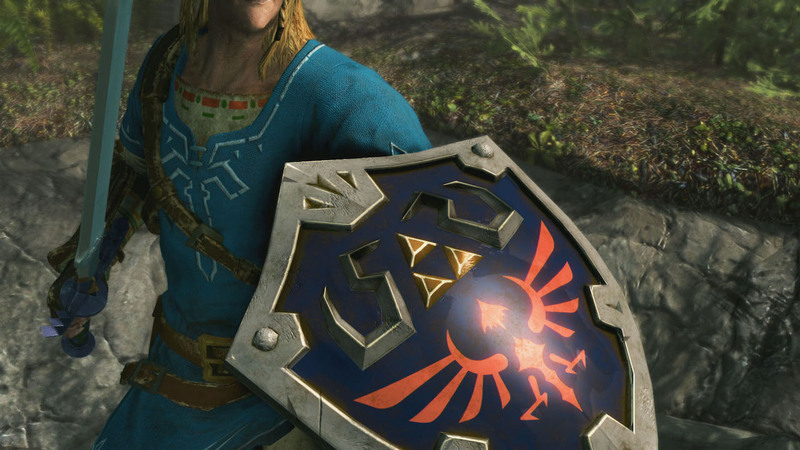 Bethesda Game Studios has also added amiibo support which lets you scan any amiibo to receive items, with The Legend of Zelda series amiibo rewarding you with the Master Sword (Damage 18), Champion’s Tunic (Armor 49), and Hylian Shield (Armor 24). These aren’t the strongest items that you can find in the game, but they can be strengthened over time with Refined Moonstone at a grindstone or workbench. It’s worth mentioning that you can obtain them without amiibo in a treasure chest at the Throat of the World, which won’t take you long to reach if you focus on the main storyline. Jeremy Soule’s revered soundtrack remains just as evocative, sometimes serene and ethereal while at other times stirring and heroic. It helps to breathe life and colour into Skyrim as a world that helps to shape your experience, the importance of which can never be understated. Whether you are arriving by horse and cart for the first time or have already courageously saved the world from destruction, The Elder Scrolls V: Skyrim continues to transcend the genre with its meticulous and phenomenal world-building. It’s that unending freedom to be anyone that you want to be, to go anywhere and be able to do anything that makes it such an engrossing world to exist in. And now that you can take that masterful experience anywhere on Nintendo Switch, it’s the perfect chance to become the Dragonborn.